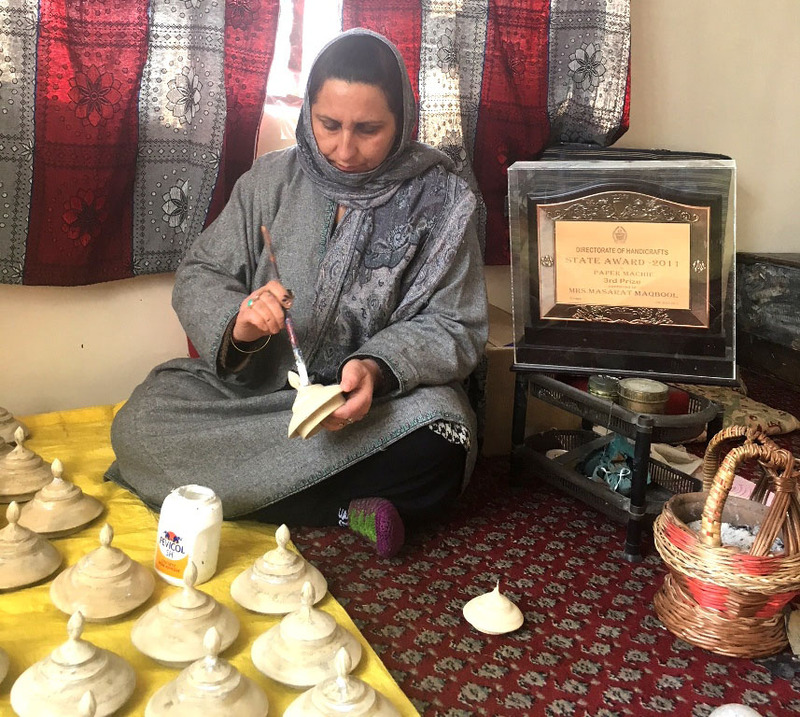 At a time when escalating unemployment rate is forcing the highly educated youth of Kashmir to apply or settle for Class 4 posts, an artisan couple from Srinagar is showing the way by safeguarding their legacy, making a decent living and trying their best to streamline the Paper Mache Art for the larger good of the society. The room is filled with the smell of paint as Masrat strokes her brush with precision, skill and confidence on the samovar, transforming it from its plain white raw structure to a magnificent piece of art. Her hand is moving with the inspiration of something that has passed down from ages and Buzurgs, forefathers to us. The way she is defining symmetry in it leaves me in awe. I’ve never seen a woman like her. Due to my increasing interest in the works of artisans, my friend and I had planned to make use of one hartal day (strike day) to have a rendezvous with the artisan couple at their home in Lalbazar, Srinagar. Masrat’s husband Maqbool sits with us in the same room. My friend had stumbled across his amazing work sometime back and was keen on meeting with him. The artist seems very humble and kind as he gives us a round in his karkhana (workplace) full of brushes, colours and ensemble of models they work on. His story is very heart-breaking. His father passed away even before he could register him in his memory. The burden of running the home fell on him at the tender age of five. He started to go to Zadibal Karkhana to learn the art of Paper Mache under a Master. He remembers leaving his home early morning and coming late night, only to earn a rupee per day. “We’ve been though gurbat [poverty],” he says, with a straight face. His mother would do ‘phamb‘, spin thread to make the ends meet. He remembers being happy on Eid because that was the only time they could afford to buy sune, meat. Times were terrible. His voice breaks down. His desire of going to school still remains like a hole in his heart but he made sure that his siblings got a good education and later his children too. My heart sinks into a whirlpool of emotions as I listen to him and watch his wife, who had intrigued me already. I know that there would be a story from her side as well. I’m curious to know more. She explains that she had been into the same thing since the very beginning. Luckily her Matamaal, mother’s home had been into Paper Mache and she learnt it’s basics from there. More than Sabakh, homework, her notebooks were filled with the floral designs and birds. Her husband worked at the same Karkhana, workshop, of her folks. And it was only after marriage that she learnt the deeper nuances of the art under the guidance of her other half. Her husband nods in approval and pride as he shows state awards, which she had received under the Directorate of Handicrafts in 2011 and 2012, but reminds us again that the journey hasn’t been easy at all. He talks about his trip to Jodhpur with his son and recalls how upset it made him when he noticed the minute detailing of the business structure around tourism and crafts there. “The way they’ve preserved every minute detail and the way government promotes it with ease gives livelihood to so many people. The interests revolving art and culture are so efficient and considerate but in Kashmir even a small project like Kashmir Haat is failing. It’s filled with dogs more than purpose. If taken care of properly, it can give livelihood to lot of us,” he says. Maqbool has received the prestigious international award under SAARC in New Delhi, but got zero recognition from his home state. He’s sure that this art will die out in coming decades, if the State doesn’t do anything to promote it. He feels that it should be taught in schools so that the children know it’s essence from the very beginning and people should address to it with respect. We ask him, if the State Handicraft has done anything significant in past two decades? Listening to them is overwhelming and we know that it’s just an edge of a thread that they’re sharing with us. We’re wrapping up by seeing their incredible work. There’re designs and colour combinations which I’ve never seen before. They’re saying that everything they do, comes from inside. To quote his wife’s exact words: “Ye Chu Zan Andre Wezan” (As if it comes from inside). They explain the extreme hard work that goes into it and minute detail for the eye that has to be maintained. It’s not something that can be mass-produced. It’s artistic to the core and they believe that there’re many ways by which we can promote our artists and fulfil our responsibility of adding to the evolution of culture; for instance, choosing our own work over foreign tiles and decorations. Mahroosh Banday is a History Graduate from St. Stephen’s College, Delhi. She is currently working on the project revolving around Kashmiri art, artisans, gender and voice. You can follow her journey on Instagram. Like this story? Producing quality journalism costs. Make a Donation & help keep our work going.